February | 2013 | Eat, Run, Crash. Posted on February 17, 2013 by Rebecca B. That's Me! I asked Chris to pick a state earlier in the year for us to visit, that is one of his little benefits to travelling with me for some of my races. He gets to pick a state he wants to visit! Colorado was his choice for 2011. 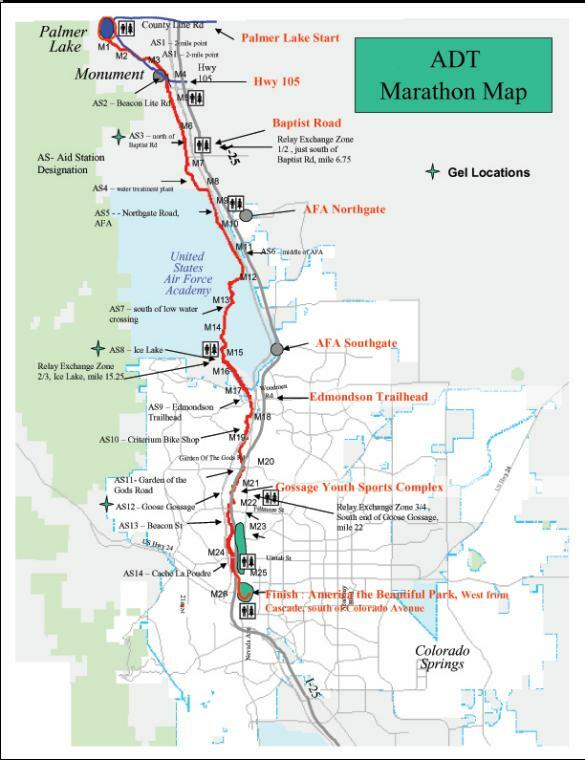 After a summer of recovery and training, I decided to attempt to run the full marathon that I had registered for in Colorado Springs: The American Discovery Trail Marathon on Labor Day Monday. I had never run at altitude before, the race started at an elevation of 7200 feet and finished around 6000. I loved the idea of the race because it was smaller and had excellent reviews. Reading about running at altitude I assumed there was no way I would finish strong. The air is thinner, so most “flatlanders” have a harder time adjusting to running at high altitude; they usually tack on a percentage of time per mile to compensate. I decided to just enjoy the race and finish around 4:45. My past three marathons all ranged at similar finish times: 4:29 – 4:40 so I guesstimated my finish with these factors in mind and zero pressure on myself. The day before the race I found a place that made gluten-free pizza and a Wendy’s was right around the corner from our hotel, so my traditional pizza/potato carb-load was possible. I also found that traveling with celiac you eat out a lot less and rely on grocery stores a lot more. I was amazed that Chris never once complained, he would eat wherever it was safe for me and never gripe about the monotonous fare. We managed to enjoy Chipotle once, but overall we mainly ate things like yogurt, fruit, nuts and sandwiches with GF bread. We spent three days in Colorado adjusting to the altitude; we literally scaled new heights the day before the marathon when we drove to the summit of majestic Pike’s Peak, and gaped in astonishment driving through the Garden of the Gods. All in all it was a wonderful time, and having a few gluten-free months of experience under my belt, no glutening mistakes were made this time around. I had become wiser and more aware. The morning of the race I stood alone in the lobby filled with other marathoners waiting for the bus to take us to the start at Palmer Lake. The race took place on the American Discovery Trail, a 5,000 mile trail that literally stretched across fifteen states (and D.C.) coast-to-coast. The course itself ran on the Santa Ana trail which was made of finely crushed gravel, sand and dirt and eventually gave way to asphalt, a first for me! My other races took place entirely on roads, this would be much more to my liking; I did a lot of trail running at home, so this would be an exciting attempt. This course was impossible for Chris to spectate since the trail was so remote, so I told him to sleep in and meet me at the finish line in the America the Beautiful park in Colorado Springs. I told him to meet me at the finish around 11:30 am just in case I finished a little sooner than expected, but I had my doubts and assured him to take his time getting ready. I was a regular Negative Nancy when it came to my expectations of this race. At the Palmer Lake start, we shivered and tried to keep warm while waiting for the sunrise. It was around 43 degrees and the air was crisp and cool. Perfect running conditions! The forecast looked to only be around 72 degrees by the time I finished with humidity around 30%. I stood in line for a last minute Porta- Jon break and chatted with other runners from various states; many of us shivered and bounced up and down just to keep warm. It was fun swapping stories of races, and very inspiring for a prospective 50-stater such as myself. The starting line was low-key, literally just taped lines on the ground and the race director standing to the sideline. No huge starting line, no DJ, no corrals, no fanfare. Just runners there to enjoy the morning for the love of running. It was my kind of race from the very start. The starting signal was simply the director yelling “Go!” and we were off. The sun was still low in the sky, but the it could not have been more breathtaking. With Pike’s Peak to my right, and nothing but natural splendor on all sides, it truly felt like a training run in the middle of nowhere. There were no spectators; occasionally a hawk hovered overhead or a deer could be seen grazing in the distance. The first mile was slow since we were bottlenecked with a narrow trail; my watch time said I ran around an 11-minute mile and I groaned to myself good-naturedly. No PR today if it was going to keep up at this rate. Once we got past the lake section the trail opened up and spread out and we all managed to get into our own rhythm and run at individual pace. It was a spectacular morning, and I marveled at the sights around me. I don’t think I ever ran a race so quiet and beautiful before. I was used to big city mega-races like Disney, Philadelphia or Las Vegas. A race of this nature was a true diamond in the rough. It was rough enough for me to stop several times to pour dirt and pebbles out of my shoes from the trails. I noticed other runners had special socks that looked like waders that fisherman use, and they ran without a care. I made a mental note to myself to invest in those for a future trail race. Fortunately I wasn’t alone, several other runners had to stop as well and we chatted briefly before moving on. I expected to fare poorly, but the low humidity, cool temps, and soft surface of the trail really kept it pleasant. As the miles ticked off I waited for the pain. I had expectations that it would be like Vermont revisited, and was ready for anything to go wrong. Regardless of the beauty of the course, I didn’t think my body would be able to handle things yet. But surprisingly things went very smoothly. Mile 15 came and went. Mile 16. 17. I glanced at my watch and did the math in my head. Could it be possible? Are the mile markers off? How could I possibly feel this damned good? Especially at altitude? Me…a “flatlander” from Pennsylvania? But my mind was abuzz with excitement: if I kept up this pace even with some walking to spare, I would PR today. The marathon was uneventful in that there weren’t people in costume, bands, cheerleaders and beer stands. But the Colorado Springs marathon was going to be exciting nonetheless. I think I was going to beat a time I never thought possible. In 2009, I ran my third marathon in Philadelphia. My previous marathon times at Disney were 5:10 and 5:12. Nothing too exciting to brag about, all I could say was I finished. In Philly I managed a 4:29 and was thrilled. I never thought I could do better than 4:45 in my lifetime, and Philly was a nice little victory. I kept glancing at my watch and marveled at how well I was doing. It was exhilarating, things couldn’t have gone better! I enthusiastically thanked the water stop volunteers, telling them how much I loved the race; the volunteers were pretty much the only spectators we had for miles. I chatted with other runners as the miles passed; we encouraged one another, asked the usual “Where are you from?” It was nice to see their reaction when I told them I was from PA and had never run at altitude. I couldn’t help it, I was just as surprised myself! Many commented on how strong I looked, and honestly, I felt strong. It was so exciting to feel this good for once. I hated admitting it felt good to pass guys that looked like they’d leave me in their dust on a normal day, a term I have heard in the running community as “getting chicked”. The sun was at full blast at this point of the race, and the dirt trails had ceased, transitioning to pavement. We were suddenly joined by recreational bikers, hikers, and strolling families; the marathon wasn’t closed off to other traffic, so we often had to weave around the pedestrian and bike traffic. Most of them seemed a little put off by runners in bibs on their trails. I don’t think they realized a marathon was going on that day! Not only that, but it started to look a little more industrial as we passed office parks and residential areas. The natural beauty of Colorado Springs had given way to the urban sprawl. A lot of people seemed to have a lot of difficulty with the altitude, but I didn’t really seem to notice it. I think the weeks of training in high humidity were paying off. PA summers are known for heat and humidity; my highest training miles were in August, one of the most brutal months. Running at 65 degrees with 30% humidity was a treat even with full sun! Granted a marathon is never a stroll in the park. The pavement made my knees ache…a little. My feet hurt…a little. But in comparison to the pain of Burlington, I felt like a million dollars. It truly was a glorious victory for me as a celiac to run a marathon and feel this good. The finish line loomed and I glanced at my watch a final time. It was true, I would PR today. I crossed the finish line with my arms triumphantly in the air and whooped. As I slowed and glanced at my watch for the millionth time I saw it: 4:19. I PR’d by ten whole minutes! I realized, though, with the PR, came a small blow. Chris missed my finish! I assumed I would have finished much slower, and instead I crushed my estimation! Grabbing several cups of water, I shuffled over to the finish line tent. As expected, the finish line food was lacking in GF options. I didn’t even care, I was still fueled by adrenaline. Chris arrived with a backpack full of clean clothes and a Think Thin bar and I enthusiastically showed him my time. He was so proud and once we got cleaned up we had plans to go to the neighboring town of Manitou Springs where they had a, gasp, 100% gluten-free crepe restaurant! I was back, and couldn’t wait for my next race. I wasn’t sure if I would ever be able to beat my time of 4:19, but I was so proud of that time it didn’t even matter. You never know how you will fare in different climates. Some thrive at high altitude while others may thrive in cold temperatures. Give yourself the benefit of the doubt and do your best! You just may surprise yourself! Smaller races, I find, bring out the nicest runners. Most of them are prospective 50-staters and Marathon Maniacs, and a lot are there to enjoy the race without a lot of PR pressure. I have found the most friendly and supportive runners are Maniacs, and I am happy to say I am now a Maniac myself simply because I was so impressed with how nice the group was at every race. I have run into some attitude and rudeness on courses that have a larger field, but let’s face it, the more people, the more chances there are that there are a few arrogant or rude runners in the bunch. I think it depends, because Disney definitely brings out some great people, so I don’t want to say this as an across-the-board statement! Finding out I had celiac suddenly came as a relief. No more questions or searching, this was the answer. I knew at this point I had no place to go but UP. It was just a matter of adjusting to a plethora of life changes. Just like that, the memories clicked into place like well-positioned Tetris pieces. The time after my half marathon in Las Vegas where I was doubled over in pain from a celebratory donut. The all-nighter of pain after a couple handfuls of triscuits. The million and one stomachaches from a simple source that was in practically EVERYTHING I consumed. My entire life I was a huge supporter of a high fiber diet, it was a life staple, especially since I had been a vegetarian for over ten years. I was a shameless wheat junkie! It was a relief to know, and to finally have a definitive answer. I needed to schedule an endoscopy immediately for what celiacs like to call the “gold star” of celiac diagnosis, like it was some kind of merit badge. While the blood tests more or less confirmed what we needed to know, the endoscopy was the final step. She started telling me all I needed to know about how to have a gluten-free lifestyle, and it was a lot of overwhelming information at once. I suddenly had so much to learn: cabinets and pantries to clear, kitchen appliances to replace (my well-used panini press was the hardest to part with), tricky cross contamination lessons to learn (and don’t worry, they came on their own without too much trouble), labels to read with a magnifying glass, and a MILLION terms for gluten-laden products to memorize (I needed a cheat sheet: barley malt, spelt, triticale, dextrin) in the process. I felt completely overwhelmed, and knew not a single person who had celiac, so I also felt slightly alienated. My world became a lot smaller. A scenario from my old life used to be defined by “Where do you feel like eating tonight?” and suddenly it became “Where CAN I eat?” Left and right doors were closing. Not only did I have a lot of ropes to climb, but I had a marathons on my plate. How would I manage my marathon training while going through gluten withdrawal and throwing myself the massive pity parties to mourn the loss of…EVERYTHING I loved in my life? I could sing an entire ballad to the tune of “My Favorite Things” just on my love of funnel cake alone! In a way I felt damned, but at the same time: furiously determined. I had so much to learn, and I wasn’t about to just roll over in bed, pull the covers over my head and let it take over. I had to act. This wasn’t a 12-Step Program to gradually learn the ropes and wean my way into it. It was time to go cold turkey on gluten, and deal with the withdrawal to come. Posted on February 9, 2013 by Rebecca B. That's Me! I’m honestly not sure when I developed celiac. I don’t know if I had it for years or if something caused a final internal meltdown to trigger it beyond the point of no return. I just know I’ve had stomach problems my entire life. Throughout high school I swigged Pepto Bismol straight from the bottle like it was my own personal flask. As a child I used to tie a belt as tightly around my stomach as I could to quell the pain (don’t ask where THAT logic stemmed from, but it seemed appropriate at the time). It just seemed that 75% of the time I was in pain or uncomfortable. There was no explanation. Throughout it all I did my best to simply live a normal life, and even when I took up running in 2004 I dreaded any long runs for marathon training because I KNEW I would have multiple pit stops; it was a real bummer. My stomach made the rules, I meekly abided. Sorry folks, but to me IBS is an acronym for “We don’t know WHAT’S wrong with you, so this should suffice until you have more complaints”. I stopped short. I had eliminated EVERYTHING but wheat: meat, dairy, eggs, raw veggies, legumes. There was NO WAY it could be wheat. I NEEDED it and I would absolutely DIE without it! I was a runner (or struggling to be one at this point) and I NEEDED wheat-laden carbs for success! I recalled an earlier phone discussion with my mom, telling her how I was finally breaking down to see a specialist. She said that she wouldn’t be surprised if the catalyst for my issues was wheat. I stubbornly declared “No way, it better NOT be! I’ll die! Give me wheat or GIVE ME DEATH!” I suddenly embodied the spirit of Patrick Henry in my declaration of love for all things wheat. There was just no way I would ever be able to give it up! Ever! There was nothing to do but get the blood work started and anxiously await my fate. The phone call from the specialist might as well have been a collect call from Neptune, I just felt like every minute was an eternity. Posted on February 7, 2013 by Rebecca B. That's Me! Every out-of-town race I run I have to do my research before heading to the location to ensure I would be able to find gluten-free friendly establishments before and after the event. As a marathoner it’s very important to get a little extra fuel in your system the days before a race, but as a runner with celiac disease it can be difficult since most of the races host carb-loading events I couldn’t dream of attending: pasta, crouton-laden salad, bread, cookies, brownies… obviously I always have to avoid them and fend for myself. Sort of sad too miss out on rubbing elbows and socializing with other runners. After a race, same deal: finish line spreads can sometimes have an amazing selection (Pizza! Cookies! Soft Pretzels! Macaroni and Cheese! Pulled Pork BBQ Sandwiches! ), but all I can usually have is fruit. Green bananas and bruised apples aren’t exactly the most appealing or satisfying post-race fuel. Plus, I always love being able to celebrate my new medal with an awesome meal. It’s fun to see if there is a new restaurant I could try – the ultimate reward for a major accomplishment. But restaurants with gluten-free options that I know are tried and true, celiac-friendly, are rare, especially in more rural areas. Sometimes, in the end, I have to bring all of my own food in a cooler for a long road trip or find grocery stores once I leave the airport and check in to the hotel. I never go without, but in the same breath it’s not always what I would ideally want. Life is not always fair, and I am long past feeling sorry for myself when it comes to missing out on things. My second state marathon was in Vermont, which came at a perfect time of year: Memorial Day weekend 2011. A perfect opportunity to take a road trip and take some time off to enjoy a short vacation. I was thrilled to see Burlington was fairly celiac-friendly. They had a fabulous co-op with great bakery options, as well as an American Flatbread, where I could get my carb-load on. Everyone has their own way to fuel up the day before a race, and in the years past, when I was running half marathons regularly, I learned that pizza and French fries was my perfect race food the night before. “Pizza-french fries” was often how it was worded, taken directly from the South Park where they learn to ski. But the days of convenience were past, and now I had to find gluten-free pizza and if I couldn’t find French fries that weren’t in a dedicated fryer, a baked potato from Wendy’s oftentimes sufficed. Sidenote: As a celiac, my mantra for food while on the road is: “When in doubt, find a Wendy’s”. They deserve major acclaim for having so many gluten-free options (including the Frosty)! I can always manage to find something to eat, even in places like the airport . In fact, one of my main carb staples the day before a marathon is their baked potato and a Frosty. I know some runners may be mortified at the idea of consuming dairy within 24 hours of a marathon, but it certainly works just fine for me. Remember: each runner has different needs, and a gluten-free/celiac runner has even more specific needs. The Friday morning drive to Vermont from PA was scenic, but very long. Vermont doesn’t really have much of an interstate, so as the crow flies (or as Google-Maps dictates) it doesn’t SEEM like it’s that far, but the back roads in gorgeous dairy-farm country definitely slowed the trip to a crawl. We were off the grid with no cell reception, the speed limits were 25 mph (and on these roads as an out-of-stater we didn’t dare speed) and we encountered torrential downpours that limited visibility. We arrived at Burlington well past the time we wanted to get there, famished and tired. The only option we could see within a close proximity to our hotel was an Applebee’s (not even close to being my favorite chain if there is such a thing), so we reluctantly took it. Since my diagnosis I couldn’t turn up my nose at chain restaurants like I used to (I used to be an adventurous foodie and loved back-alley-hole-in-the-wall establishments), they were the only places I felt safe going to because of their detailed allergen disclosures. I scanned the gluten-free menu they provided and saw HOORAY that I could have chips and salsa. I am a huge lover of all things salt and was starving at this point. My salt-loving Id needed instant gratification and there was no way I could stand waiting another minute. We enjoyed the chips while waiting and I had a fairly decent meal. I just lamented at the loss of dessert, it was always my favorite part of every meal out, and with celiac you are lucky if you can even get sorbet. The days of cake, cookies and brownie sundaes had sadly come to a close. Oh well, the running joke with some of us in the celiac community is that you don’t have to go on a diet after New Year’s. Upon checking into at the hotel, I felt an old and familiar feeling stir within me. My long-standing enemy was back to its old tricks. Something was definitely wrong, and I knew I had somehow been “glutened”. One huge rule I carelessly forgot to follow is “Even if the menu says gluten-free, triple-check and ASK”. I had a lesson to learn on designated fryers, and it wouldn’t be the first time either. Something can be naturally gluten-free, like tortilla chips, but when they are thrown into the same fryer with something like chicken fingers, it is a cross-contamination disaster. Despite my best efforts to remain gluten-free, I managed to really do myself in with a simple mistake. The rest of the weekend was more or less staged for me. We made efforts to explore Burlington the Saturday before the race even though we managed to get over half an inch of rain that afternoon; I did my best to enjoy pizza at American Flatbread (HIGHLY recommended and amazing place! They really do know their stuff and their pizza is one of the best I have ever had), and grabbed some amazing baked goods at the co-op to enjoy later (who would have thought someone could invent a gluten-free vanilla whoopee pie? ), but the effects of the glutening were obvious. I felt exhausted, achy and nauseous. We crashed at the hotel after a long day of walking around trying to stay dry, and did our best to get a good night’s sleep before the early morning bus trip to the start. Sunday morning arrived with sense of foreboding to it. Rain was falling and it was already very warm for May. Burlington had just experienced flooding from heavy rains in the days beforehand; temperatures were climbing and the air was stiflingly humid with an atmosphere could be cut with a knife. There were already warnings being posted about the race since they were expecting a high of around 81 degrees; the organizers instructed the runners about the significance of colored flags at the water stops: Green meant all systems go, yellow: proceed with caution, red: REALLY proceed with caution and black meant the race would be stopped and runners would be directed off the course. Running in low humidity, even when warm, is far more ideal than high humidity; it’s impossible to breathe efficiently and perform your best. The humidity when the race began was close to 100% (Weather Underground proves that this is not an exaggeration!). The bus ride to the start from the hotel was solemn. I was still not feeling good, and dreaded the idea of running a marathon in the rain. Besides the glutening, I also worried about blisters. This humidity made it impossible to keep your feet dry. I felt Chris was a good sport, especially since potentially he had to spectate in the rain for hours. I gave him a final farewell hug and kiss and found a place to wait for the race to begin. Rain continued to fall steadily as thousands of runners huddled in the starting area. The race began and we took off. Within 5 miles of so, the rain ceased and the sun peeked through the clouds. The course was beautiful with Lake Champlain as the backdrop and a lot of green foliage as we ran through the streets of Burlington. The boisterous spectators were out with umbrellas and cowbells cheering us on, which really helped to boost morale. I had noticed in the early stages of the race I was already aching and sore. Usually I am accustomed to high mileage runs, and during a marathon it’s pretty easy to start having aching knees in the final miles without a walk break. My knees already started aching around mile 7, and that was a bad sign. I thought to myself that it must have been my inflammatory response to the gluten, as I never had knee problems this early in a race. Around mile 15 is when the runners endure what is affectionately known as “The Assault on Battery” which is an uphill climb on Battery Ave. I had some hill experience, so this was no different. You simply look down, run up and eventually reach the top. The climb was 6 city blocks, and crowds lined the sidewalks to cheer us on enthusiastically. One girl looked mortified at the sight of the hill; I advised her to just look down and eventually you’ll reach the top– it’s all mind over matter and every hill has its zenith. In my case, I wasn’t so sure I could follow my own advice, but I tried to encourage my fellow runners. In the distance I heard the steady beat of a Japanese Taiko drum band that matched our footfalls as we marched up the hill, and I prayed silently that I could make it to the top. The beat of the Japanese Taiko band was slow and steady, and with each beat of the drum words pulsed in my mind “I-can-do-this-I-can-do-this”. Being an experienced hill runner I found myself passing more and more runners as we steadily climbed. Each block passed was a mini victory; I wouldn’t walk, wouldn’t quit. My stubborn determination prevailed. Getting to the top was glorious, and the crowds were roaring enthusiastically. I also saw Chris, faithfully spectating and cheering for me to keep going. I tiredly smiled and waved to assure him I was fine, but felt completely wiped out. By this point we had ten miles remaining; this is the stage of the marathon where there’s a faint light at the end of the tunnel: when you can start counting down the remaining miles in single digits. With the race more than halfway over, the heat and humidity climbed, and the water stop flags reflected what we all knew: dangerous conditions were developing. The flags initially were yellow, but soon the red flags hung limply in the heavy air. The course at this point was in full sun; the rain clouds had given way to a sunny sky dappled with clouds. This would be perfect for a picnic or a hike in the woods, but for a full marathon it can be dangerous. A course with little shade, warm temps and high humidity can really slow you down. Your body gets covered with a gritty layer of salt when dehydration takes its toll and you feel like a sponge that’s been in the sun for weeks. At this point no amount of water or Gatorade could quench my intense thirst. The race wound through some nice suburban neighborhoods and the residents were out with Ice pops, watermelon, orange slices, extra water bottles and hosed us down with sprinklers. They knew as well as we did the weather was winning this battle and did whatever they could to help push it back. To the kind residents of Burlington, thanks for your support! My knees felt like metal spikes were driven through them. My muscles were on fire and felt like slabs of concrete. I kept stopping and stretching, but nothing could ease the pain. The sun beat down mercilessly and my mouth felt like it was stuffed full of cotton. My heart began to race and my breathing labored to where I felt like I was having an exercise-induced asthma attack. With merely six miles remaining, I felt beaten…it might as well have been 100 miles. This was my fifth marathon. I had some experience under my belt, and knew the signs of having to slow down. The glutening had taken its toll and every inflammatory response in my body was at Level 10. I slowed to a walk and felt absolutely overpowered by the elements. I would walk a few minutes, shamble like the walking dead with a slow jog, and then walk again. I felt completely defeated, the pain was beyond excruciating. I felt like crying: the heat, humidity and pain that wracked my body just made me think that this would be my last marathon ever. I had never felt anything like it, it was totally demoralizing. I shuffled my last mile and a half alongside another runner who was a nutritionist, and my having celiac came up as we struggled to the finish. She was shocked that I was even running on the course having been newly diagnosed (my endoscopy was literally just a few weeks before), and told me I was doing great despite it all. The finish line loomed, muddy from the rain, and I mentally forced myself to finish strong . Every footfall was like a spike going through my legs, and I burst into tears of gratitude when it was finally over. I weakly accepted a cold bottle of water and a medal around my neck. I hobbled stiffly to find Chris, tears falling, my jaw clenched with frustration. I felt crushed. I truly wanted to PR that day and it was a race that horribly went wrong in every way. Finding food was almost pointless; I managed to find yogurt and plain vanilla ice cream, but so soon after a race dairy products just seemed wrong and nauseating on so many levels. I would eventually manage a real meal on the way home at an Uno’s, where it was quite surprisingly AWESOME. Gluten-free pizza and salad came at just the right time. The server really knew his stuff and I felt right at home. On the drive home I lamented the race and started to doubt myself. I didn’t think I would ever be able to run a marathon again. My number was up. I had already registered for a marathon in Colorado Springs for September and felt like I had no choice but to downgrade to the half. After Vermont I thought there was absolutely no way I could do this again. I figured I would give myself some recovery time and see, but it didn’t seem promising. That feeling doesn’t linger too long. As a celiac, it’s best to rely on your own food the day or two before a race. It is not worth risking a glutening, it’s pretty much guaranteed to ruin your experience. If you can’t bring your own food, find establishments that you know to be reputable and saavy in regards to gluten-free food preparation. DO NOT rely on just gluten-free ingredients, double-check on how the food s prepared and if there are designated grills and fryers. If you want a French fry fix, I have found the one tried and true establishment is Five Guys. Nothing else goes into their fryer but potatoes. You can’t beat that! You will very likely not PR on warm days. Every marathoner I spoke to, many of them Maniacs who encouraged me to join their Asylum, agreed that the 2011 Burlington race was very difficult and just flat-out sucked. Just slow down, hydrate, earn your medal, and chalk it up as a bad experience. It’s not just YOU, most of us fare poorly in high heat and humidity. When hazard flags are raised on the racecourse, it’s best to just slow down, hydrate, walk if needed, and finish. Set your pride aside!